High creative skills have been shown to be somewhat more common in people who have mental illness in the family. Creativity is also linked to a slightly higher risk of schizophrenia and bipolar disorder. Certain psychological traits, such as the ability to make unusual or bizarre associations are also shared by schizophrenics and healthy, highly creative people. And now the correlation between creativity and mental health has scientific backing. 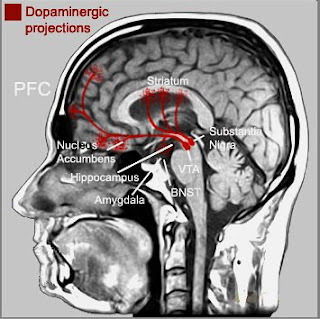 "We have studied the brain and the dopamine D2 receptors, and have shown that the dopamine system of healthy, highly creative people is similar to that found in people with schizophrenia," says associate professor Fredrik Ullén from Karolinska Institutet's Department of Women's and Children's Health, co-author of the study that appears in the journal PLoS ONE. "The study shows that highly creative people who did well on the divergent tests had a lower density of D2 receptors in the thalamus than less creative people," says Dr Ullén. "Schizophrenics are also known to have low D2 density in this part of the brain, suggesting a cause of the link between mental illness and creativity." The thalamus serves as a kind of relay center, filtering information before it reaches areas of the cortex, which is responsible, amongst other things, for cognition and reasoning.